Busy as a Honey Bee: Oh How Fit! This week's Pinterest finds relate to my plan to keep the weight off! So here are a few recent fitness finds that i may try out! Believe it or not, I enjoy the treadmill! Running on it is fun, but gotta get back into it! So here are the tunes to go along with my treadmill workouts! A few more notes to add to my playlist! This would help to accomplish one of my bucket list items! This looks lke something i could do to change it up a bit! Love Jillian Michaels! Some exercises to work out my legs! This is definitely a quote i need to remember! 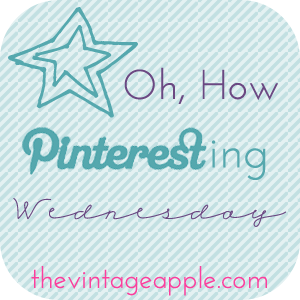 Those are my pins for my weekly link up with The Vintage Apple and her little apple for Oh How Pinteresting! Hope you enjoyed or found something helpful! Click the button below to find more pins! Oh and BTW follow me on Pinterest too! PS. Forgot to mention yesterday that we actually took a trip to Arizona too! How could i forget that awesome getaway! Loved it and will totally be going back again next year! Blog Life.... BONUS POST ! Wow! What a Clean Microwave You Have!